Rapid change is keeping bank CEOs on their toes as they seek to meet the surging demand for financial services in a fast-growing but volatile region. Record earnings and bulging loan portfolios are commonplace for banks in the Middle East as surging oil revenues stimulate economic growth and create rising demand for banking services and wealth management. From the construction boom in Dubai to the volatile stock market in Riyadh, evidence of change and speculative excess is easy to find in a region bathed by the rising tide of petrodollars flowing in from around the world. Meanwhile, big international banks such as Citigroup, Goldman Sachs and Morgan Stanley are expanding their presence in the region in the expectation that the price of oil will remain high for an extended period and that this under-banked area of the world will offer significant opportunities as governments boost spending, economies diversify, and legal and regulatory systems are reformed to promote private sector investment. Douglas Dowie, chief executive of National Bank of Dubai, says the most difficult part of his job is keeping up with the pace of change. “Dubai’s economy is growing at a 14% annual rate, which is faster than China,” he says. The bank’s loan portfolio increased 68% in 2005, but Dowie says National Bank of Dubai is still a very conservative lender. “We take particular care to see that our assets are of the highest quality, and this has been recognized by the ratings agencies,” he says. National Bank of Dubai is establishing an investment bank subsidiary in the Dubai International Financial Center. The newly incorporated unit will advise on mergers and acquisitions throughout the region, Dowie says. The bank has received initial approval from the central bank to establish an Islamic finance company subsidiary and expects to have it in place by the end of this year. Ahli United Bank’s earnings rose 55% last year and increased 56% in the first quarter of 2006 from the same period a year earlier. The bank’s success is attributable to its focused vision and defined strategy, El-Labban claims. “We create an expanding client base through acquisitions and convert these new banks to sustained earnings by developing their consumer and wealth-management capabilities,” he says. In December 2005 AUB acquired a 49% stake in Commercial Bank of Iraq. Besides the countries bordering the Gulf, AUB considers Egypt and Lebanon to be important secondary markets for the bank because of their synergy with the Gulf, according to El-Labban. As Global Finance went to press, AUB had a due-diligence team in Cairo considering a $700 million acquisition of Delta International Bank, which has 18 branches in Egypt. “We also intend to acquire a bank in Switzerland at some point, to serve our private-banking clients,” El-Labban says. AUB introduced Islamic financing services, including home mortgages and consumer and corporate loans, in 1992 in the UK, when it was known as United Bank of Kuwait. AUB opened its first fully-fledged Islamic branch in Doha, Qatar, on June 15, 2006. Any transaction made at the branch will be Shariah compliant. The private equity market in the Middle East is growing rapidly, in both the number and size of funds. The industry could triple in the next five years, says Rod Palmer, managing partner of the Dubai office of Walkers, a global offshore law firm. Palmer cites a confluence of factors for his upbeat forecast, including high oil prices, a real estate boom, a marked increase in infrastructure development and privatizations, and stellar returns on initial public offerings over a short history in the region. What’s more, private equity fund structures are consistent with Shariah principles of sharing in risks and rewards commensurate with capital contributions, making such deals attractive to Islamic investors. Funds in the Gulf region are being fully drawn down after 18 months instead of five years, Palmer says. This allows managers to establish follow-up funds, often much larger than the original. In the first half of this year, 31 funds were seeking to raise $18.2 billion, compared to a total of $5.8 billon raised in the Middle East and North Africa, or MENA region, between 1994 and 2005, Palmer says. “We are seeing a new and growing trend for investment in other MENA economies, as those countries embark on deregulation,” says Robert Varley, a partner in Walkers’ Dubai office. “We expect to see a significant growth in the number of funds investing in India and Pakistan,” he says. Dubai International Capital, a subsidiary of Dubai Holdings, is helping to establish regional-focused private equity investment funds. The company made an anchor investment in the $272 million JD Capital fund that targets opportunities in Jordan. Sylvain Denis, senior vice president and head of direct investment at Dubai International Capital (DIC), says, “Jordan has a close affinity with Dubai, and it has a lot of privatizations and an active capital market.” DIC and HSBC launched a $500 million fund in March to invest in infrastructure in the MENA region. DIC is also the largest investor in Ishraq, a company that is introducing the Holiday Inn Express brand of hotels to the region. DIC made a $1 billion strategic investment in DaimlerChrysler in early 2005. It also has acquired Tussauds and Doncasters of the United Kingdom. “We look for large buyouts of well-established companies,” Denis says. Ghazi Abdul-Jawad, president and CEO of Arab Banking Corporation, based in Bahrain, says his biggest concern is systemic risk. “Even though our bank is very healthy, any misfortune befalling the region, or heightened political instability, will affect our business,” he says. “Our region is an unstable region. There have been three regional wars in the last 25 years. I have every reason to be worried,” he says. “You have to be adept and alert and fine tune your contingency planning. We are very well prepared. We are experts in crisis management,” he adds. ABC’s earnings for the first quarter of 2006 increased 144% over the same period a year earlier. “The first quarter was a very good one,” Abdul-Jawad says. “All areas of the bank have performed well. We have positioned ourselves in the money book for higher US dollar interest rates, and, therefore, we have benefited from the higher rates which flowed through our financial markets,” he says. “Our loan book did extremely well, and we had no deterioration in asset quality. We have not participated in lending to the boom in real estate or the stock market,” he points out. ABC is committed to buying a retail bank in the Gulf Cooperation Council (GCC) region, preferably in the United Arab Emirates if one is available and affordable. The bank is also seeking an operating license in Libya. The United States said in May that it was restoring normal diplomatic relations with Libya for the first time in more than 25 years, and Abdul-Jawad says that trading relations will follow. “The competition from international banks in the region is coming in droves, and that will continue,” he explains. “It makes the landscape crowded and highly competitive. For that, we need to match the competition in terms of hiring the best talent available and offering the most competitive benefits to our staff, because the talent is a mobile asset,” he says. Growth opportunities in Bahrain’s domestic market can be found in the fund-management business and in the insurance market. “We are keeping our costs down by focusing on re-engineering our processes and looking at alternative delivery channels and outsourcing,” Abdul-Jawad says. Gulf International Bank, a Bahrain-based bank with a merchant banking strategy focused on the GCC states, earned a record $203 million in 2005. The bank’s lending increased by 33%. “The greatest demand for loans is expected to continue to be in the corporate and project finance fields,” says CEO Khaled M. Al-Fayez. “This field is driven by the buoyant economic conditions prevailing in the region, where many projects are expected to be financed in the oil, gas, petrochemical, power and water industries throughout the GCC,” he says. 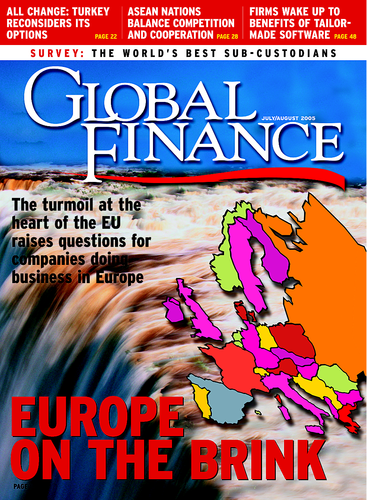 GIB is the leading bank in the region’s project finance market. “Last year we increased the support we provide to international contractors and sponsors involved in projects in the region through the issuance of performance and project-related guarantees and working capital facilities,” Al-Fayez says. Revenue generated by GIB’s investment banking business grew by 26% in 2005 and by 80% in the first quarter of 2006. In the past few months the bank advised on two major initial public offerings: the $119 million Saudi Paper Manufacturing IPO, which was oversubscribed by six times, and the ongoing $582 million IPO of Albaraka Banking, which was preceded by a private placement of $425 million in April.